In a major boost to the international community’s trust in peace and law and order situation in Pakistan, British Airways has announced to resume its flights to and from Pakistan after a disruption of 10 long years. 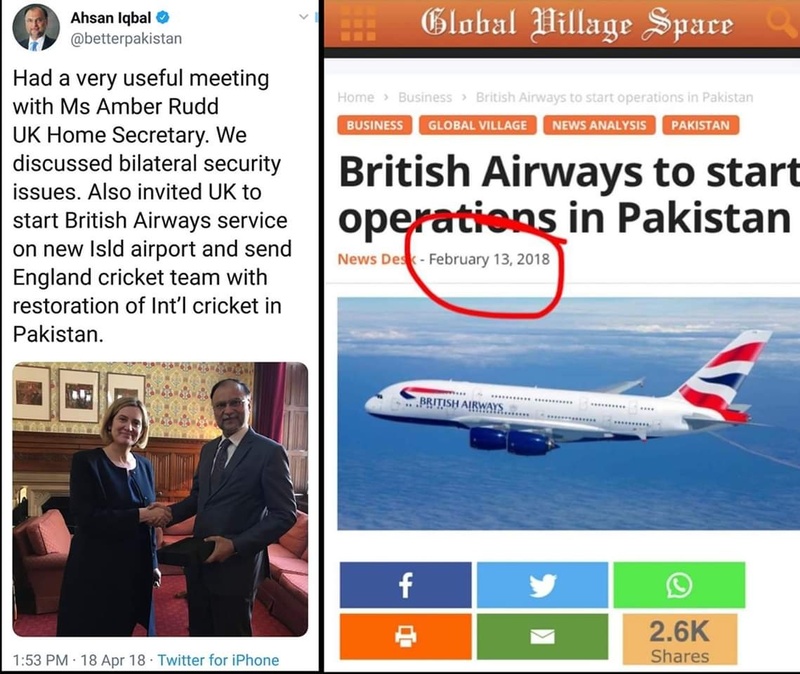 The announcement was made by an official of the airline, at a press conference, who was accompanied by UK’s High Commissioner to Pakistan and other Pakistani officials. Robert Williams, Head of Sales for Asia Pacific and the Middle East for British Airways, said that the carrier believes the route will be particularly popular with the British Pakistani community who want to visit, or be visited by, their relatives. He said that the airline was resuming its operations to Pakistan after a gap of 10 years. British Airways had discontinued its flight operations to Pakistan in 2008 after the deteriorating law and order situation in the country. On the occasion, British High Commissioner to Pakistan Thomas Drew remarked that there has been a marked improvement in Pakistan. It is heartening to note peace and order has been restored in Pakistan, he added. The airline will run three flights in a week to Pakistan. The flight operations will begin from June next year. The flights will be operated from Heathrow Airport to Islamabad. Meanwhile, Federal Minister for Information and Broadcasting, Fawad Chaudhry, congratulated the nation over the British Airlines’ decision to restart flight operations to Pakistan. He specifically mentioned Zulfi Bukhari and thanked him for his six-week long tireless efforts that yielded in such an announcement from a major European airline. Soon after the announcement, Director General (DG) of Inter-Services Public Relations (ISPR) Major General Asim Ghafoor took to Twitter to rejoice the decision. Do you live in Pakistan? if you do, that makes you part of “Qaum”. If you don’t, you don’t have any right to post such comment as it only makes you “Bewaqoof”, “sasti shohrat ke bhookay” and “najaiz” comment poster. Have a nice day! RAW & CIA (militant & terrorist) rented whole buildings with people and they use fake profile to make fake comments. Apart from such activities, the problem with being active on social media or platforms like this is that no one has to face anyone as we do in real life. And that gives anyone/everyone freedom, to a very harmful extent, to say/post/share anything without having to worry, or even think, about consequences of one’s actions. Everyone, before saying/posting anything on online platforms, must stop for a moment and ask themselves, “Do I have the guts to talk about, what I am going to post here, if I am talking to a large group of people in real life?”. This approach definitely has the power to stop today’s most concerning problems, like trolling, hate speech and cyber bullying etc, which ruin, or in extreme cases end up taking, people’s lives. It will boost confidence of foreign tourists and also more airlines to come here and help in promoting tourism . Will also have effect on business tourists to the country.